If you can’t eat right at every meal, Atkins diet shakes are a convenient way to stick as close as possible to the plan while adding variety as well as consuming vitamins and nutrients. User reviews: These tasty shakes are enough to satisfy a sweet tooth! As long as you avoid sugar products, your taste buds will adjust to these meal replacement shakes which contain a safe artificial sweetener. User reviews: Unfortunately, the key problem with the dry mix shakes is that they don’t mix well with water, and the taste isn’t as good as the ready-to-drink shakes. 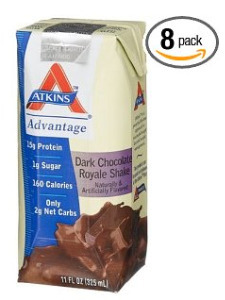 While Atkins markets the shakes as acceptable to drink in all four phases, many dieters have found the shakes as well as the Atkins Advantage bars to be diet “stallers”; their weight loss stops while they are drinking the shakes regularly. 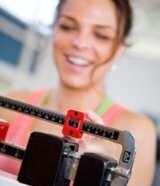 That won’t be true for everyone, but you will learn what you can tolerate while on the Atkins diet. One other potential disadvantage is that the shakes could act as a “trigger food” reminding you too much of the “real thing.” If it is true for you, then it might not be a good idea to drink them. You need protein at every meal and the shakes are a good way to get it, especially if you are an active person without a lot of time to do meal preparations. While other diet brands such as Slim Fast are loaded with sugar, the Atkins diet shakes are healthy and are designed to help curb sugar cravings – not trigger them. These replacement shakes are creamy and delicious, an ideal product for anyone trying to limit carbs and calories while increasing their protein intake.